alaTest on kerännyt ja analysoinut 181 arvostelut lehdistä ja verkkosivustoilta. and the G Pad 7.0, which are also being launched at the same time. The internals are practically identical across all three devices, with a quad-core 1.2GHz Snapdragon CPU, 800 x 1280-pixel IPS screen, 1GB of RAM and 16GB of internal storage. Included stylus too small; Low resolution display; Sluggish, below-average performance ; The LG G Pad F 8.0's isn't even close to tablet competitors with better screens, longer battery life, stronger value and faster performance. 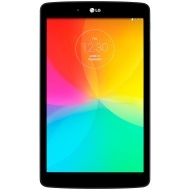 LG has impressed of late with its powerful flagship devices, but still needs a hero in the mid-range tablet market. Aiming to do just that is the G Pad 8.0, but does it succeed? LG bringt mit dem G Pad 8.0 ein kompaktes Tablet für kleines Geld an den Start. So viel sei vorneweg verraten: Das G Pad 8.0 kann im Test überzeugen.